Hheat the olive oil in a large heavy-based saucepan over medium-high heat. Add onion and garlic. Cook, stirring for 5 minutes or until softened. Add prosciutto. Cook, stirring for 2 minutes or until golden. Add rice. Stir to coat in mixture. Cook for 1 minute. Add 1/3 cup hot stock. Cook, stirring constantly, until liquid is absorbed. Continue adding stock, in batches, until liquid is absorbed. Remove from heat. Add parmesan and spinach. Stir until spinaci has wilted. Season with pepper. Set aside to cool. Cover and refrigerate for some 2 to 3 hours or until cool. Place flour on a plate. Place egg in a bowl. Place breadcrumbs on a plate. Using wet hands, roll 1 tablespoon risotto mixture into a ball. Using your thumb, make an indent in centre of ball. Place 1 piece of mozzarella in indent. Shape risotto mixture around formaggio to enclose. Repeat with remaining risotto mixture and mozzarella. Dip a ball in flour, then egg and breadcrumbs. Place arancini balls on a tray lined with baking paper. Repeat with remaining balls. Refrigerate for 30 minutes. Heat vegetable oil in a large, deep saucepan over medium heat. 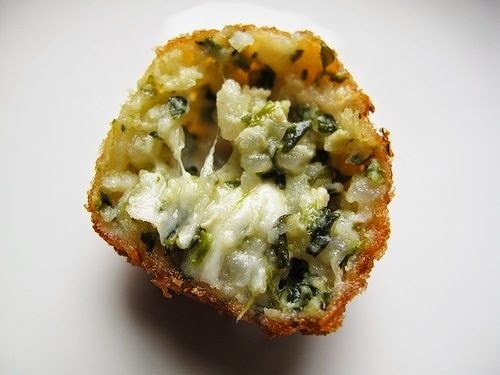 Cook arancini, in batches, turning, for 3 to 5 minutes or until golden. Drain. Cover with foil to keep warm. Serve with limone.